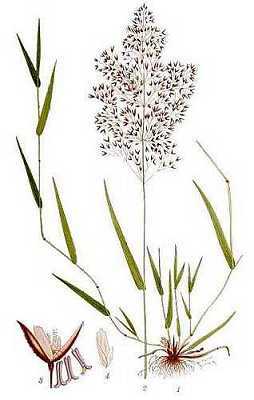 Agrostis capillaris.Kurt Stüber.Robert W. Freckmann Herbarium.University of Wisconson at Stevens point.wisplants.uwsp.edu (Accessed 4/2014). 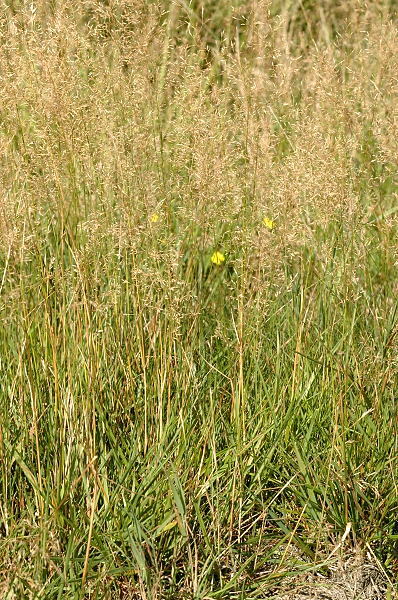 Agrostis capillaris is a perennial C3 grass (Wand et al.) 20-60cm; spreading by rhizomes, stems loosely tufted, leafy; sheaths smooth. Leaves alternate, 0.2-0.4 cm wide, flat, dull green, ascending, tip sharply pointed, base truncate, meeting edges of ligule, sheath edges overlapping. Flower spikelets 1-flowered, glumes equal, 1-veined, lemma membranous, palea 1/2 to 2/3, as long as lemma; inflorescence 4-15 cm long, open, delicate, often reddish in bloom, branches smooth, naked toward base; blooming and fruiting June-Sept.
Habitat: A common lawn grass, escaped in open areas, tolerates soil pH 4.9-7.5, moderately tolerant of fire, anaerobic soil, salt, intolerant of shade and drought (USDA, NRCS 2006).